The puck just got chipped into our zone and we had a couple of guys changing, that I was changing for, and it’s kind of the way 3-on-3 overtime goes. They were trying to get a change but I was coming out of the blueline door, so that’s probably 30, 40 feet for them to change and I just got in behind them and went low blocker. You always try to catch guys off changing, that’s the most challenging thing. I mean, I’m pretty sure we had possession of the puck the whole 3-on-3, puck possession is all…you don’t want to give it up for a mediocre shot. You curl back, even go out of your zone, we even throw it to Quickie every once in a while, just to relieve pressure and keep the puck. We’ve been pretty good at it, ever since they implemented the 3-on-3. Those types of changes are hard, a lot of goals are the result of guys just trying to get off the ice. I think, ultimately, what’s happening is we’re playing a lot better in our d-zone and that’s something we’ve been really good at for a really long time here. We weren’t very good for the first long while, the first part of the season and we haven’t up nearly as many chances, nearly as many shots and as a result, I think it helps us win games. We’ve also had contributions up and down our lineup, much more consistently the last five or six games, so that’s another part of it. We would’ve liked to have won it in regulation, obviously, but they got a lucky bounce on that goal, I don’t think anyone can disagree with that. [It was] a lucky bounce that went in and we stayed positive on the bench and we said “hey, let’s go win this one in OT”…actually, we wanted to win it with a few minutes left, we still had a minute left and we had some chances at the end, so we were hoping to win it there. It was a huge game for us, a big win, great game by everyone really. We could’ve played better but we played decent enough to win. You know, on that winning streak we had before we lost last game and won tonight, we felt that we were playing so much better. You’re going to win games and not play well, maybe tonight we didn’t play our best hockey, but we felt like we were playing our best hockey in that stretch. When you’re playing your best hockey, it’s just so much fun, the confidence is flowing through every player on the team and we need to get back on another winning streak, because we dropped one last game to Vegas and then won tonight and we’ve got a big match against Vegas tomorrow. I thought we did some good things in the game tonight, but we didn’t do enough offensively, I think we had under 20 shots and that’s not very good, especially in an overtime game, we should have ten shots a period, or eight shots at least. It’s definitely a good feeling and our goalie’s going to steal us games every once in a while and they do. I think if you play well defensively, and your intentions are to do the right things, you’re going to get more wins than you’re not. You can kind of not be great offensively, and get a win, but if you’re not going to be great defensively, you’re going to lose the game no matter what. We seem to know how to play good defense in here, and if we keep doing that we’ll get more wins. It was a good feeling. We knew we’d come in for a hard-fought game. I thought we played well early, they got some momentum in the third but it was nice to comeback and win in overtime. It was good, we won the draw, which helped and Toffoli made a good battle down low too, to keep the puck alive once we were in jeopardy of losing it. The guys played hard, it’s a tough building to win in. Yeah, we feel a little bit more confidence in our game, like we feel when we’re going in that we’ve got a chance to win every night and that’s a good feeling. We’ve had lots of tough games lately, every team you play, they’re a good team. Nothing’s ever easy. – With the overtime victory, Los Angeles improved to 70-51-12 all-time against the Colorado franchise, a record that includes a road mark of 30-31-4. These teams have one game remaining: January 19 back here at Pepsi Center in Denver. – With the win, Los Angeles moved to 11-12-1 against the Western Conference, 4-6-0 against the Central Division, 7-4-3 in games decided by one goal, 5-3 in overtime games, 12-3-1 when scoring first, 9-8-1 when tied after the first period, 11-1-1 when leading after the second period and 10-13-2 when outshot by their opponent. – Forward Dustin Brown scored his team-leading 11th goal of the season with the game-winning goal. – Kings defenseman Sean Walker scored his first career NHL goal in the victory. Walker is the third Los Angeles player, joining Matt Luff and Austin Wagner, to score their first career NHL goal this season. – Blueliner Drew Doughty scored for the first time since November 24, ending a 17-game scoreless drought. Doughty’s goal was his third of the season overall. – Anze Kopitar has now collected a point in eight of his last ten games played, collecting his fourth multi-assist game of the season in the process. Kopitar scored the 299th goal of his career on Saturday and is one shy of 300 for his professional career. – Los Angeles attempted 39 shots (18 on goal, 8 blocked, 13 missed). Colorado attempted 55 shots (24 on goal, 20 blocked, 11 missed). 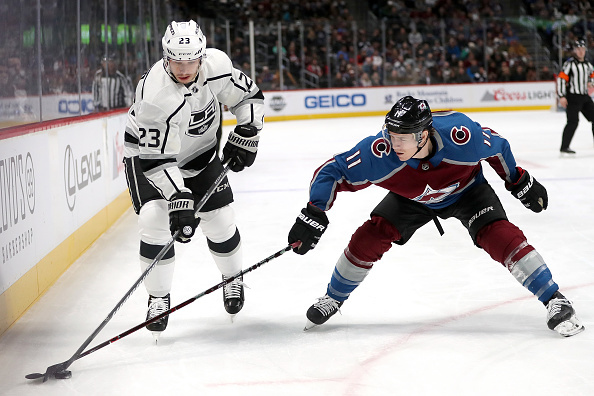 Defenseman Drew Doughty led the Kings with four shots on goal, while the trio of Nathan MacKinnon, Carl Soderberg and Tyson Barrie each tallied four shots for Colorado. – The Kings won 28-of-59 faceoffs (47%). Anze Kopitar won 13-of-24, Nate Thompson won 4-of-11, Adrian Kempe won 3-of-5, Jeff Carter won 8-of-19. The Kings will travel to Vegas this evening, before a 6 PM puck drop against the Golden Knights tomorrow. The Kings are scheduled for a 10:30 AM morning skate as of now, but that is expected to be optional.